Paper is a fantastic material that has inspired artists and designers to create works of art for centuries. 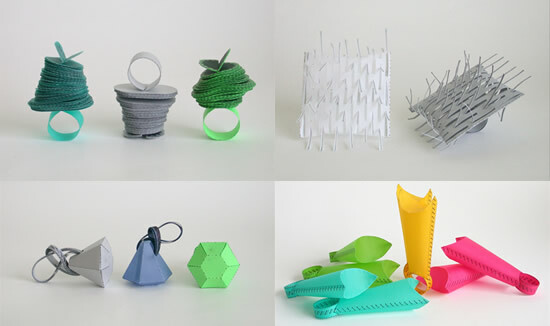 To follow up the successful Holland Papier Biënnale, which CODA Museum organised in cooperation with Museum Rijswijk, CODA Museum will exhibit the works of no less than 21 visual artists and 16 jewellery designers from both the Netherlands and abroad. 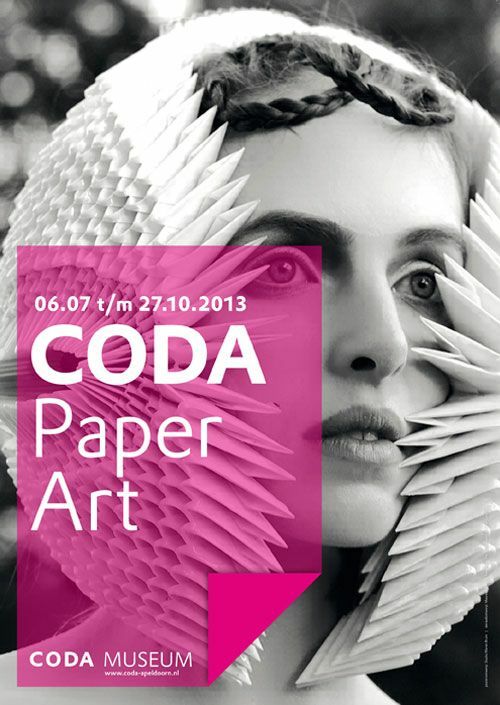 The artists whose work will be shown in CODA Paper Art do not limit themselves to working solely with paper. Visual artists and jewellery designers who have worked with paper occasionally or even just once will be included in the exhibition as well. Reusing paper and cardboard often goes hand in hand with the development of new techniques. 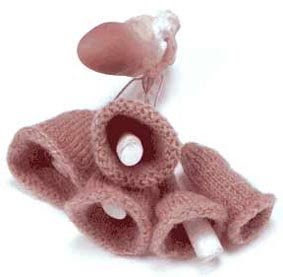 A unique example is KrantHout, produced by designer label Vij5 and Mieke Meijer. KrantHout is a material that turns old newspapers into wood again. The old newspapers undergo several processes that convert it into a hard, wood-like substance that has many similarities with unfinished wood and can be used and treated the same way. Exhibiting jewellery designers: Attai Chen — Ana Hagopian — Lydia Hirte — Mari Ishikawa — Tia Kramer — Nel Linssen — Hannah van Lith — Jorge Manilla — Alix Manon — Maureen Ngoc — Shari Pierce — Mette Saabye — Flora Vagi — Nhat Vu Dang — Bronia Sawyer — Tatiana Warenichova. The pendants created by the German jewellery designer Lydia Hirte (1960) look deceptively simple. Nothing could be further from the truth, however. Hirte works with thin paperboard from which she cuts flat strips. Moving the strips a certain way with her hands creates a tension. Nothing is stapled or glued together. The cardboard basic shapes of these pendants are cut out by hand. Angles and sides are coloured with ink. A layer of varnish gives a special shine. Lydia Hirte studied at the University of Pforzheim. The jewellery is surprisingly light when handled, and every jewel has its own surprise element. A pendant releases a stream of confetti when you pull a handle, or a coloured segment of a bracelet lights up when you put it on. Nhat-Vu Dang hopes to bring people closer together with this playful element. Attai Chen (1979) works with cardboard, which he tears or cuts into small pieces and then turns into a three-dimensional jewel. The work Chen creates this way can be completely different from the initial drawing he made for that particular design. The shape of the object is not planned. Chen does know what he wants to make; a brooch, necklace or ring, and he pays a lot of attention to how the jewel will be attached, and to its wearability. The collection compounding fractions is a series made of recycled paper. Attai Chen attended the Academy of Art and Design in Jerusalem. He graduated as ‘Meisterschüler’ under the supervision of Otto Künzli in Munich. 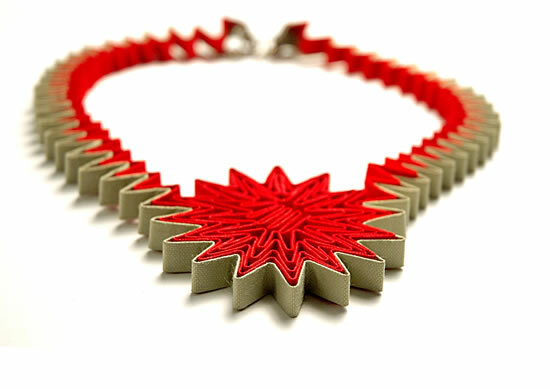 Ana Hagopian has been making paper jewellery since 1994. 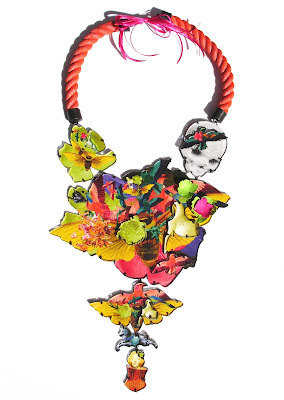 Her jewels are inspired by the shapes and colours of exotic fruits and special plants she has encountered on her travels. Hagopian plays with the texture and qualities of both the original fruits or plants and those of paper. She cuts and pastes until a new shape emerges. 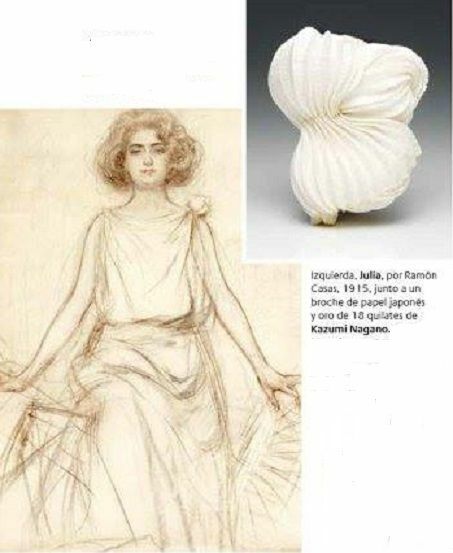 Ana Hagopian attended the University of Buenos Aires (fine arts and interior design). She has been living in Spain since 1982. Tia Kramer describes herself as an ‘installation, sound, and jewellery artist’. 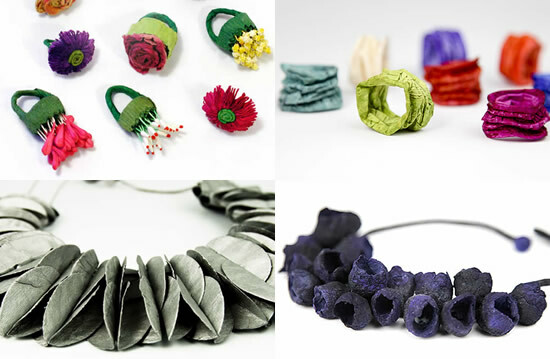 Her jewellery designs are made of handcrafted paper that Kramer makes from the Philippine banana plant. She makes wire constructions, without soldering, and covers them with this paper. 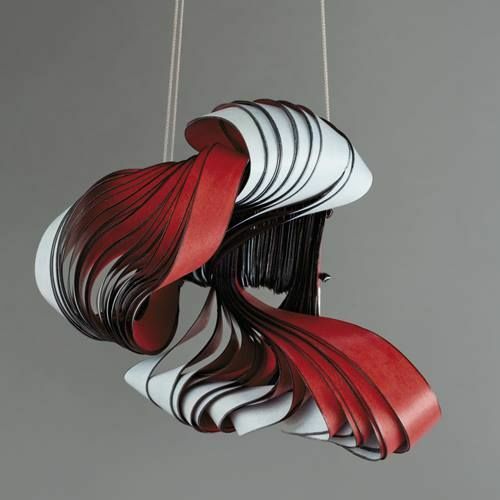 The wearer’s movements create lively sculptures. 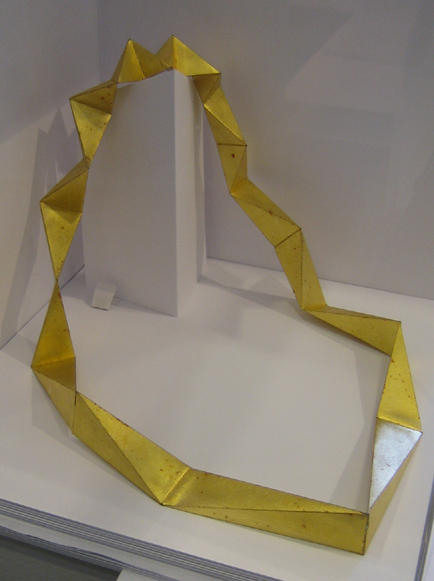 Kramer’s jewellery resulted from a request to create a three-dimensional miniature model of a large sculpture that was to be placed on the campus of Macalester College in 2003. Mari Ishikawa’s (1964) draws inspiration from the traditions and customs of her native country for the design of her jewellery. Relationships, ‘en’ in Japanese, are a recurring theme. It can be the relationship between form and material, but also the relationship between thoughts and surroundings or between emotions and material. In addition, Ishikawa-Vetter often uses the colour red. In Japanese culture, red refers to the sunset, temples and holy places, ceremonies and the bond between two people. When the Japanese describe people in love they often use the expression ‘they are connected by a red ribbon’. 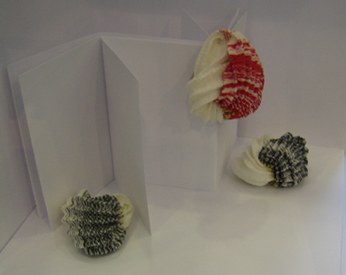 The use of paper as a basic material is also a clear reference to Japan. Ishikawa-Vetter uses Japanese kozo paper and Japanese lacquer combined with silver and pearls. When the work is finished, it often looks like jewellery with lace, buttons and wire constructions.
. “I aim to find a balance between simplicity and dynamics in my designs.” Mémoires des vacances (2010) is an example of said simplicity and dynamics. 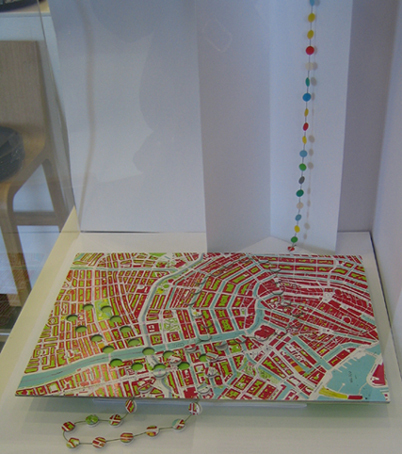 The folding technique and materials Van Lith used in this work reflect the journeys she has made and the map that guided her. This way, the inside of the brooch becomes a globe. Hannah van Lith is currently taking her master’s degree at the Academy of Fine Arts in Antwerp. Tatiana Warenichová - In the collection ‘Fairy Teller’, Warenichová tries to combine the right colour combinations of the fashion season in a brooch, thereby giving the spirit of that season its due. 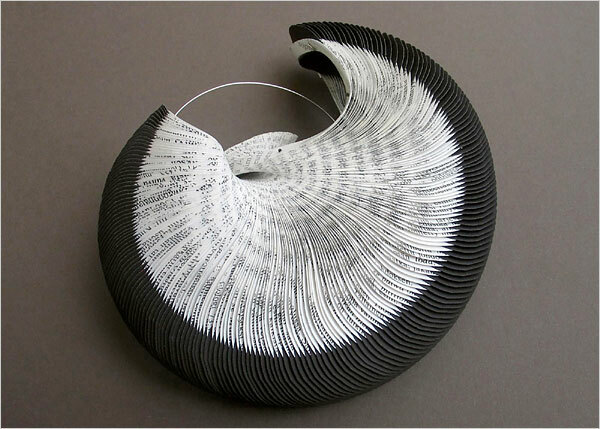 Warenichová sets herself the challenge of combining techniques; joining together layers of paper, glued to wood or board and finished with silver. The motifs of her brooches are derived from well-known Slovakian fairy tales. Warenichová tries to capture the highlights of each of these stories in her objects.Tatiana Warenichová studied at the Academy for Fine Arts in Antwerp, where she gained her master’s degree in 2010. She lives and works in Bratislava. Flóra Vági’s (1978) main sources of inspiration are organic shapes and materials. 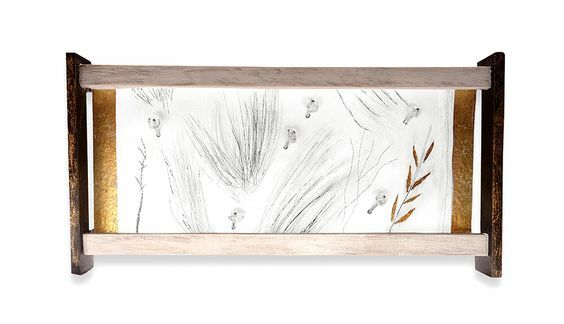 She worked with exotic types of wood for a long time but finally decided to focus on paper as her basic material. Paper’s unlimited potential gave her work a new dimension. The brooch Ala Pervinca combines the pages of a book in a new shape with gold leaf and acrylic paint. 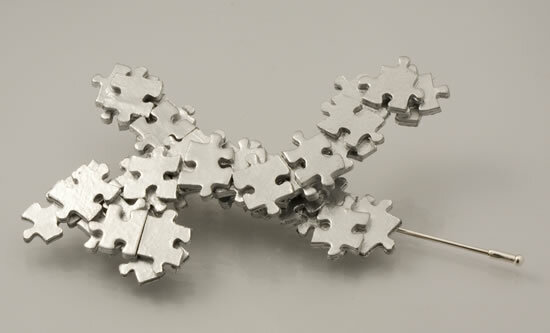 Vági won the World Craft Council Award with this brooch in 2012. 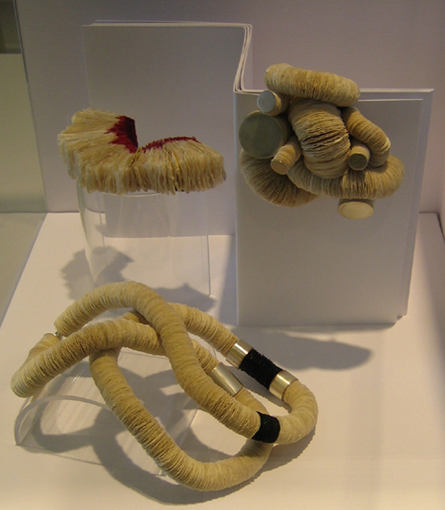 Mette Saabye (1969) is known in Denmark and abroad as one of the most innovative and experimental jewellery designers. Although she puts together collections sporadically, she usually creates one-offs that may or may not be tailored to specific people. Saabye uses both expensive and cheap (waste) materials but mostly allows herself to be inspired by whatever is available. Gold rings decorated with buttons from grandmother’s button box are not an unusual combination. Paper is also a material she likes to incorporate in her jewellery. Saabye feels it is important that the object is interesting on multiple levels. In addition to a sound theoretical basis, the jewel should have decorative qualities.Mette Saabye has won several prizes, including the St. Loye Prisen, a prize awarded by Copenhagen’s Goldsmith Guild to support young talent. She opened her own gallery and studio in Copenhagen in 2005. Alix Manon (BE) brooch – For the brooch and pendant that will be shown during CODA Paper Art 2013, Manon used recycled paper, which she treated with paint and ink. By piling up shapes, she creates a new image. Alix Manon attended the Royal Academy of Fine Arts in Antwerp. She also studied at the Academy SAIMAA University of Applied Sciences in Imatra (Finland) for a year in order to familiarise herself with the use of various techniques & the simplicity of Northern European design. Shari Pierce (1973) is mainly inspired by the objects she encounters on the street in everyday life. She takes photos of everything she sees. This can result in seemingly random images of piles of cardboard boxes by the side of the road, protest marches or dilapidated sheds. 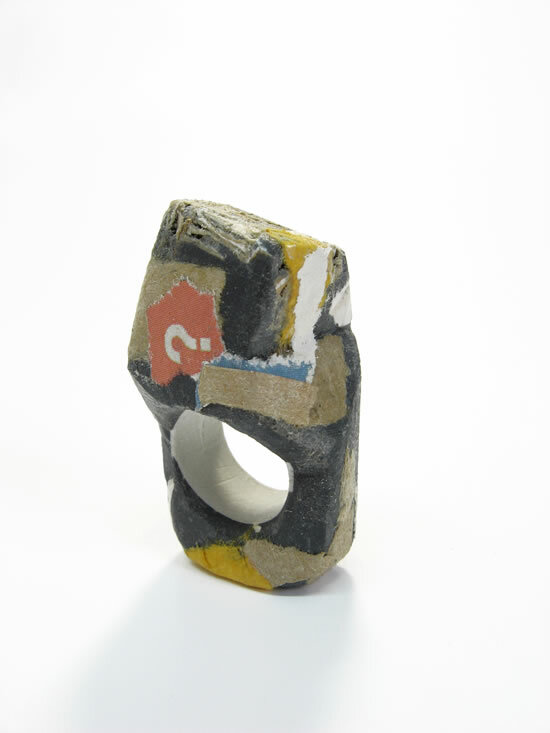 She takes the material she finds on the street with her and incorporates it into her jewellery designs. 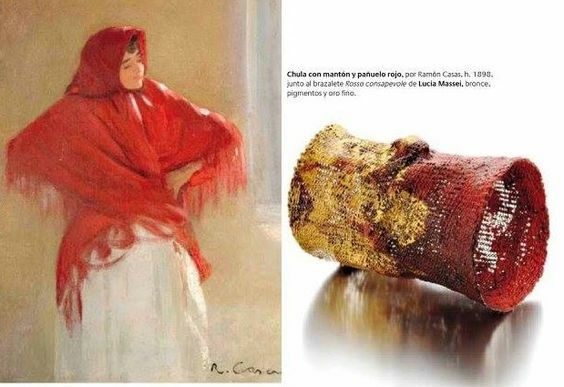 These pieces of jewellery are either fragile or monumental compared to the photographic images, which capture the material in a broader context. Pierce combines the materials she finds on the street with precious metals, giving her jewellery a new shape and meaning. 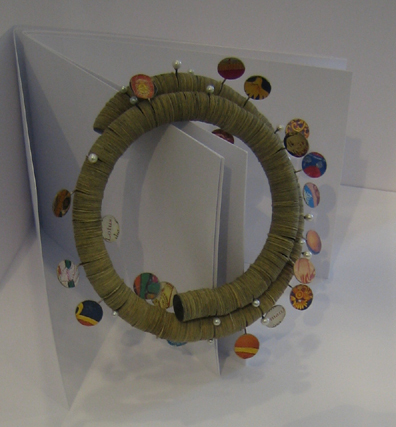 Nel Linssen (1935) has been creating jewellery and objects made of paper for over thirty years. Her work can be found in museum collections all over the world. Maureen Ngoc (1989) recently graduated from the London College of Fashion with My Ngoc; a collection of jewellery and fashion accessories made of paper. This exceptional collection shows that contemporary jewellery is often a fusion of ancient traditions and modern techniques. Ngoc based the collection on three-dimensional patterns and traditional origami techniques. The result is a collection of conceptual jewellery that is not only designed to be decorative but can also be seen as body armour. Ngoc drew inspiration from the shape of bird feathers when designing My Ngoc. 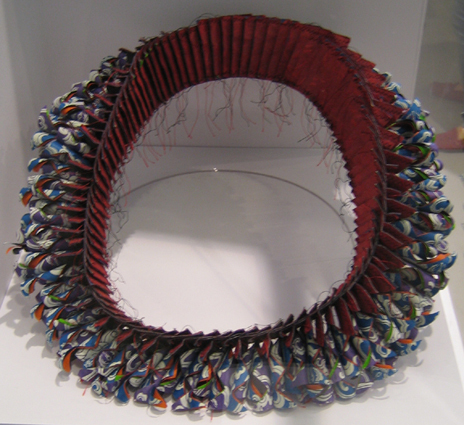 The jewels are made of thousands of folded sheets of paper and follow the wearer’s movements. These movements constantly result in new shapes and three-dimensional patterns. The collection was photographed in black and white by Tho Vu. même ne parlant pas allemand, ça je comprends …. et j’approuve ! The geometric basic forms are clamped or stuck together. They are not glued. « An old-fashioned radiator, the bellows of an accordion, döner kebab on a skewer but also voluptuous shellfish, brightly coloured miniatur folded paperchains, peculiar swings – on gossamer strings. 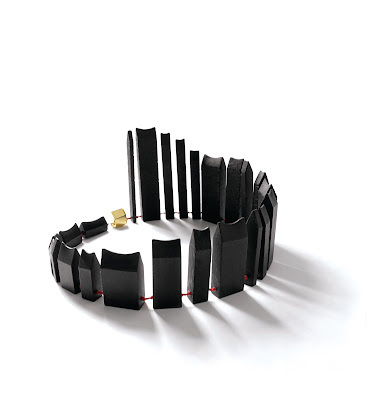 The jewellery with a ‘twist’ by Lydia Hirte cannot be pinned down to just one definition. The pendants of German artist Lydia Hirte … look misleadingly simple. What is more, it is impossible on the basis of a picture alone to estimate the scale of the little treasure bundles on her necklaces. The clean forms and colours conceal the effort and intensity involved in getting these trinkets into their finished state. however small the definitive ornaments may be, they put up quite a struggle when being forced into their straightjacktets. Lydia Hirte declares her love of paper through the directness and tangibility of the material itself. The paper responds immediately to her touch; she feels the effect her fingers induce. In her quest for a strong image she allows herself to be guided by the materials’s properties. exhibited late last year (2009) at the prestigious Triennale Design Museum in Milan. The show was titled Paper Jewels and it was an all-embracing exhibition dedicated to jewellery made of paper from 60 designers all over the world. The 8th Holland Paper Biennial will be on show in the Museum Rijswijk and CODA Apeldoorn from 8 June till 12 September 2010. The Holland Paper Biennial 2010 consists an exhibition of work by international paper artists in both museums. The traditional paper fair will take place in Museum Rijswijk and the old church (opposite of the museum) on Sunday 12 September from 13.00 till 17.00. 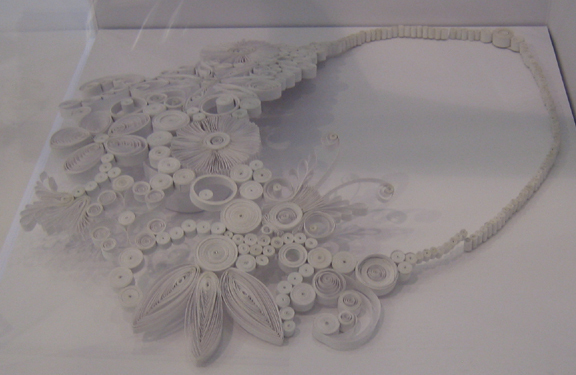 Jewellery made of paper gets special attention at this biennial. Katharina Dettar uses crumpled, faded photos as the basis of her brooches. After treating them with paraffin wax, she mounts them in silver with a combination of semi-precious stones and bone. 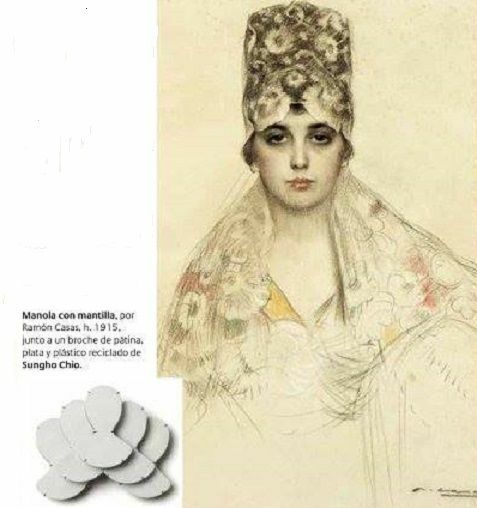 Although the following artists share the common technique of layering paper in their jewellery, their method of execution is completely different. Lydia Hirte creates her pendants with layers of thin card. She tests the paper to its absolute limit by twisting and fixing it into contorted, abstract shapes. 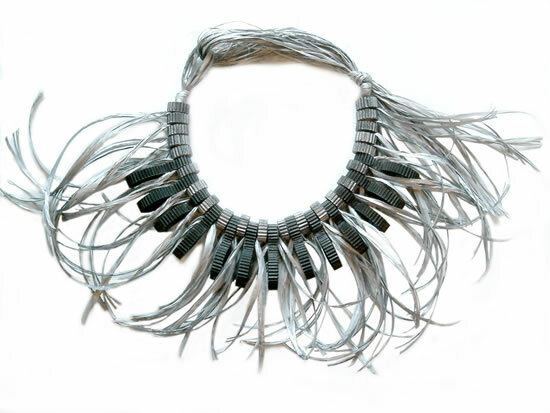 Janna Syvänoja makes jewellery from hundreds of layered pieces cut from used paper, threaded one by one onto steel wire. 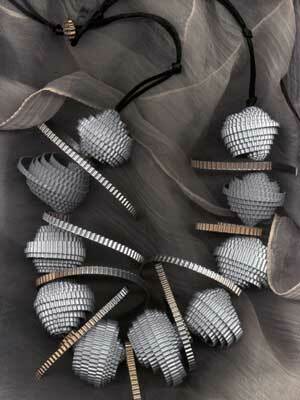 Her work seems to grow organically, reminiscent of shells and bones. 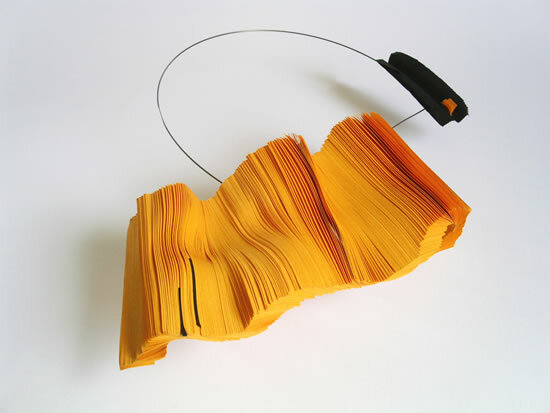 The armbands of Susanne Holzinger are born out of layers of different coloured paper glued together and then carved into sculptural shapes. 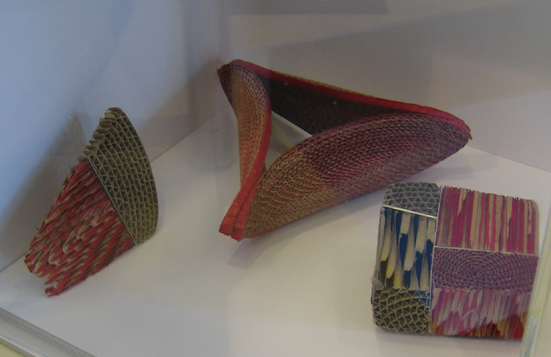 Closely related to these jewellery pieces, is the work of Noriko Takamiya. Using the traditional Japanese craft of basketry as her starting point, she develops new forms and techniques. She winds layers of thin strips of paper around each other, interweaving them into Escher-like objects. * Schatzkammer Australien -Treasure room Australia. Opening: 25.2.,18.30 h.
Max-Joseph- Str. 4, 80333 München. 26.2.-10.4., Di, Mi, Fr 10-18, Do 10-20, Sa 10-13. So 7.3. Special opening 10-14 h.
Alexander Blank, Eunmi Chun, Stefan Heuser, Mari Iwamoto, Jasleen Kaur, Märta Mattson, Hajime Matsuo, Masayuki Nagata, Christopher Thomson-Royds. *Danner-Rotunde. Neu. Kuratiert von Karl Fritsch, ab 6.3. Opening. 5.3. 19 h.
Broschen von Volker Atrops, Peter Bauhuis, Waltraud Erlacher, Therese Hilbert, Otto Künzli, Karen Pontoppidan, Bettina Speckner. Kerstin Becker, Susanne Elstner, Monika Jakubec, Michaela Köppl, Kristina Kundt, Gabriele von Miller-Lehsten, Daniela Osterrieder, Renate Schmid, Renate Scholz, Ines Schwotzer, Gottlinde Singer, Monika Vesely, Hanni Weber. Christine Graf, Lisa Juen, Toni Mayner, Patrick McMillan, Kathryn Partington, Jessica Worley. Mo-Fr 11-14 und 15-19, Sa 11-18 h18 h: Dormitory_Bauleitung_Laboratorio. Schmuck im Schlafrock aus 7 Ländern. 18 h: Eternal shine – it´s not a pony. 5.-7.3. 18.30 h: Daniel Kruger. 4.3.-25.4. Tiina Rajakallio, Tarja Tuupanen, Maria Vuorinen. Peter Müller, Dagmar Stühler, Mirjam Hiller. 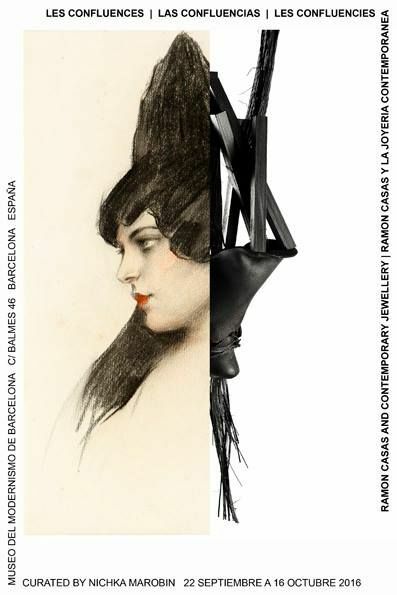 a travelling exhibition of French contemporary jewellery. Baloge, Boucher, Boyer-Pellerej, Braham, Brugger, Deltenre, Grimonprez, Hanagarth, Kampfert, Lacoste, Le Gal, Lehmann, Marguier, Meunier, Natier, Perret, Traon. P. Bishai, A, Death, R. Gilbert, B. Humphries, J. Patterson, J. Robinson, P. Scura, Timothy Information Limited, R. Terry, A. Toch. 19 h: Jewellery Mia Maljojoki bei “Meisterschüler 2010“ 6.-14.3. 11 h: Returning to the Jewel is a Return from Exile 2. 6.-7.3. 11 h: 3 x GOLD. 6-8.3. 12 h: Claus Bury – Maßstabssprünge. 9.3.-13.6.